The twbhosting Website Manager makes it easy for you to edit your Meta Tags and create a Site Map each time you add a new page to your website. Meta Tags are hidden pieces of coding that are used by the search engines to help them list the pages on your website. Global Meta Tags are tags that apply to your whole website and can be easily set in your Admin Control Panel by clicking on the "My Website" tab and clicking the "Edit Meta Tags" link (shown below), where you can specify the title, description and keywords to be used for the site, as well as any additional HTML required in the header, such as coding from Google used as site verification (also see Site Map below). Please note that Google no longer uses keywords when it lists a website, so emphasis needs to be given to your title and description, as well as the actual text used on each page. When you create a new page, you have the option of using the Global Meta Tags that you have set for the whole website or adding specific Meta Tags for that page only. You can improve your listings on the search engines by adding specific Meta Tags for each page and updating your Site Map whenever you create a new page (also see Site Map below). 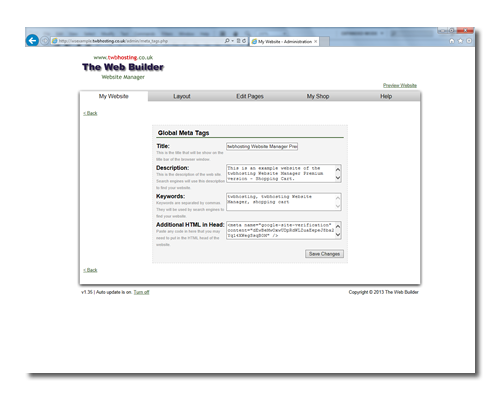 The twbhosting Website Manager has an option to include the automatic generation of a Site Map as used by the search engines. This option is turned off by default and can be turned on by ticking the box in the "My Website Details" section (go to "My Website" tab and click the "Edit Details" link under the "My Website Details" section). A Site Map helps a search engine to list every page of a website, and, please note that the Site Map will not include any Hidden Pages that you create, or Products that are inactive, for those with the Premium version.